Got my contacts in the mail. This post is about a personal experience as a patient. It's about how I saved 40% on my contact lenses. My experience reflects one snapshot of the level of price transparency within the contacts lens market. The intent of this post is not to argue for either more or less amount of price transparency in healthcare. 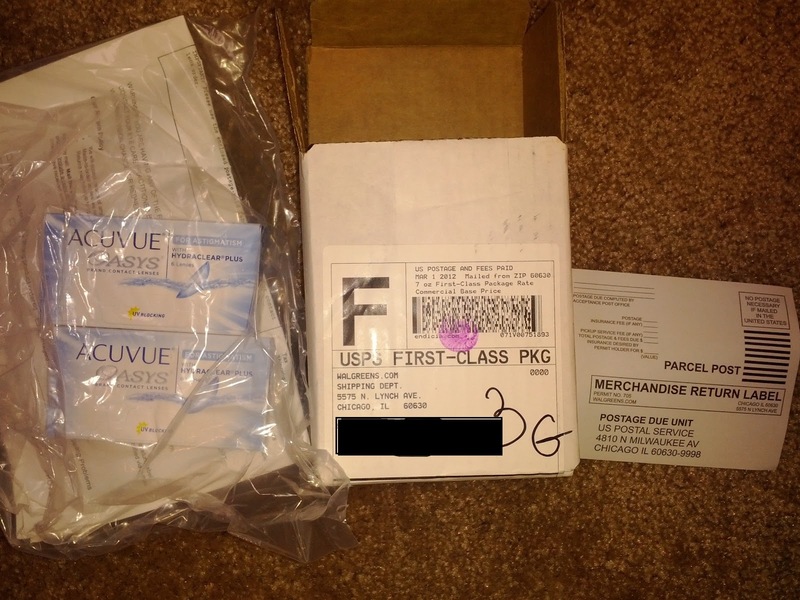 I ordered my contacts all by myself last week. By that I mean I went on www.walgreens.com, put in my contact's specs from my doctor's prescription slip, and paid for it --- all in one process. I'm not an educated contacts consumer, but a typical one. I've been wearing contacts for the last 7 years and last week, I ordered and paid for my contacts by myself for the first time. Here's what I've done before that: I call my ophthalmologist and ask him order it for me, pick up from his office and pay him. The average price was $50 per box (6 lenses) per eye, or about $100 for both eyes. My ophthalmologist controlled the supplier and the price, so I was a powerless consumer who accepted whatever price he selected for me. However, I didn't know how much prices varied and hence I did not care. After getting my contacts prescription this past month, I decided to google "acuvue oasys for astigmatism" and actually look through the results. I clicked on the the "Shopping" tab and here's what I saw - link - prices per box as low as $17!! I was skeptical. I clicked on the first result and saw Walgreens was selling each box for $41.03, shipping included. I decided to do it. Notice I chose the most expensive choice on the list, Walgreens. I did this only because I recognize the store and I decided I can trust it. Before buying, I googled "walgreens contacts coupon", why not? BAM, first result was a 20% off coupon for contacts through www.walgreens.com. This reduced the per box price to $30.39, compared to ~$50 that I usually pay my doctor. Price of ordering by myself: $60.78 per 2 boxes with shipping included. Price of ordering through my eye doctor: ~$100 per 2 boxes. This means, a year's supply (12 boxes, derived from 6 boxes per eye) will cost $364.68 instead of $600. Keep in mind, the other choices on Google Shopping results are even cheaper than Walgreens. This was blog-worthy to me due to the significant price difference. This can be caused by many things. One reason might be there are a lot of inefficiencies in the lens supply chain. Another reason might be the ability of lens manufactures to legally and effectively price discriminate. Regardless, there's definitely opportunity. Lastly, I will say that my ophthalmologist stated he does not profit from ordering contacts and sells them to patients at his buying price. This information creates more complications and demands its own post... perhaps in the future. This is a appropriate blog for anybody who hopes to be familiar with this topic. You realize a whole lot its almost tough to argue with you. You definitely put a different spin using a topic that's been discussing for decades. Great stuff, just wonderful! Optimized360 - Dental Websites | Web design for doctors in affordable price. Let us look at typically, how a healthcare recruitment agency operates? It is understood that if a candidate applies for a job vacancy in the health care industry through a trusted, experienced and seasoned healthcare recruitment agency, he has more chances of being hired.